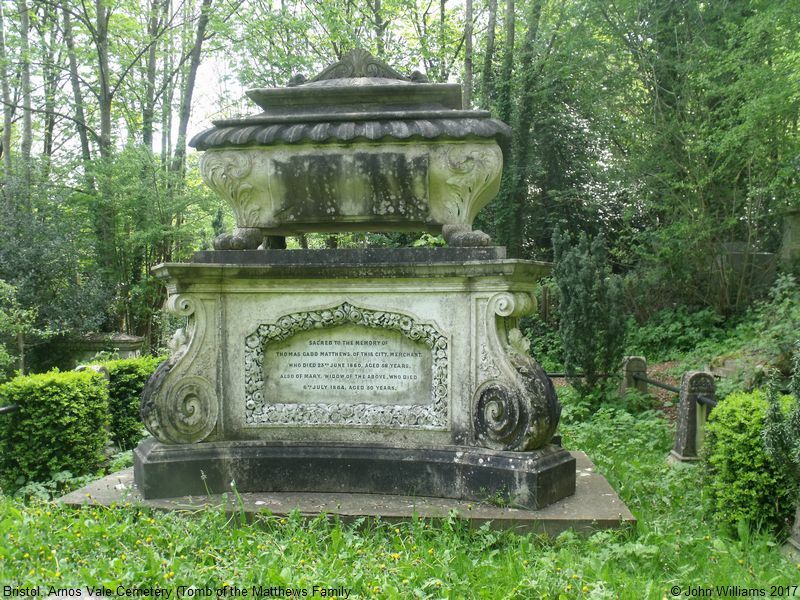 This Cemetery or Burial Ground was founded in 1837, and we understand it is still open. There are Chapels for the Church of England, Nonconformists (both Grade II Listed Buildings) and Holy Souls Cemetery for Roman Catholics. Several of the monuments are also Listed. The Chapels date from around 1840, and were built to designs by Charles Underwood. 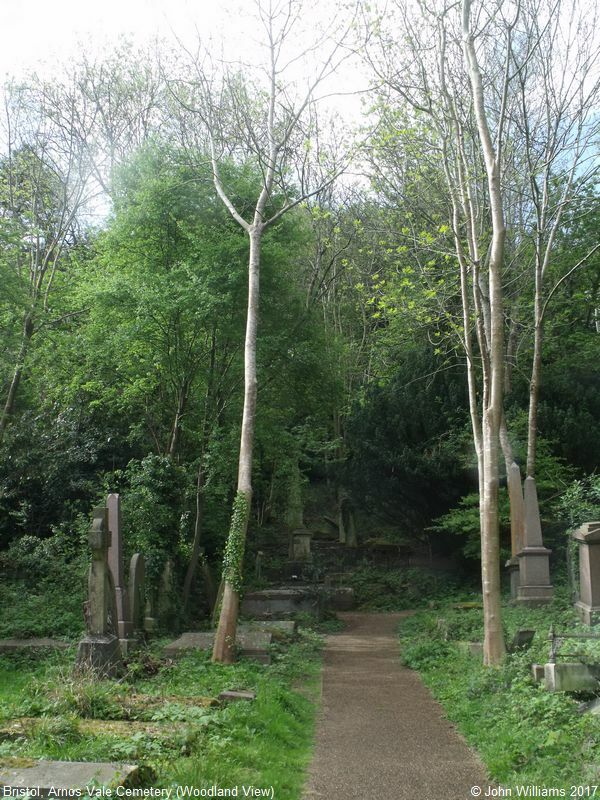 The site now covers 45 acres, and (as of 2017) is in the care of the Arnos Vale Cemetery Trust, a UK registered charity. 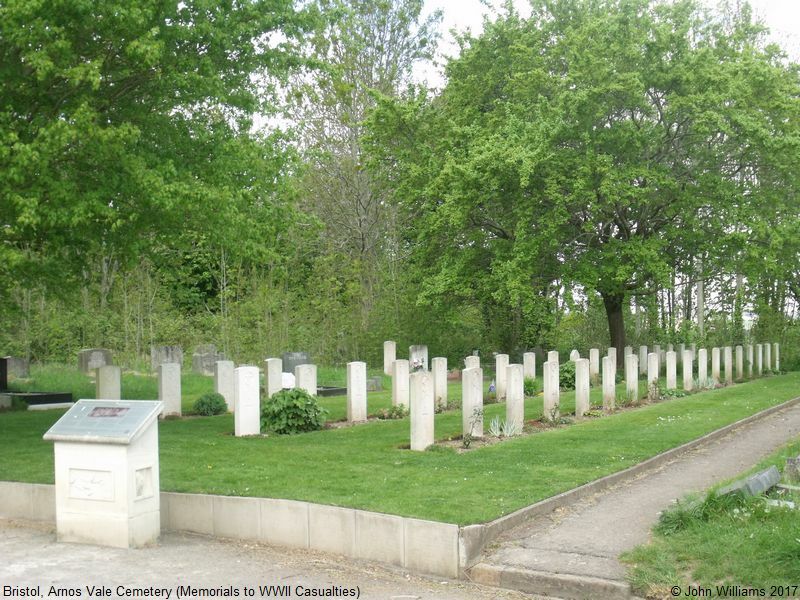 Our first photograph shows a General View of the Cemetery - pleasantly rural. Photograph 2 shows the memorial to the first burial which took place here, of Mary Breillat, who was buried on 29th July 1839. At that time the whole hillside was open fields, with a view overlooking Bristol. 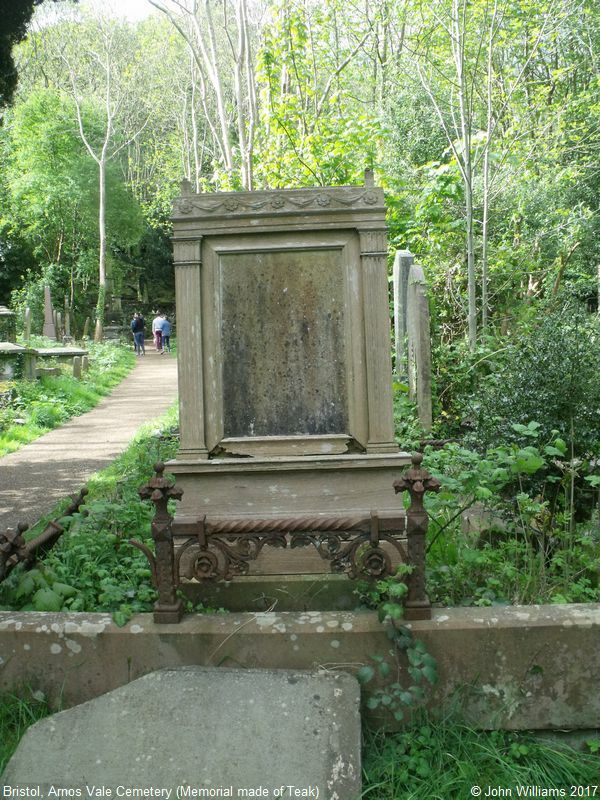 Photograph 3 shows the Tomb of the Matthews family. 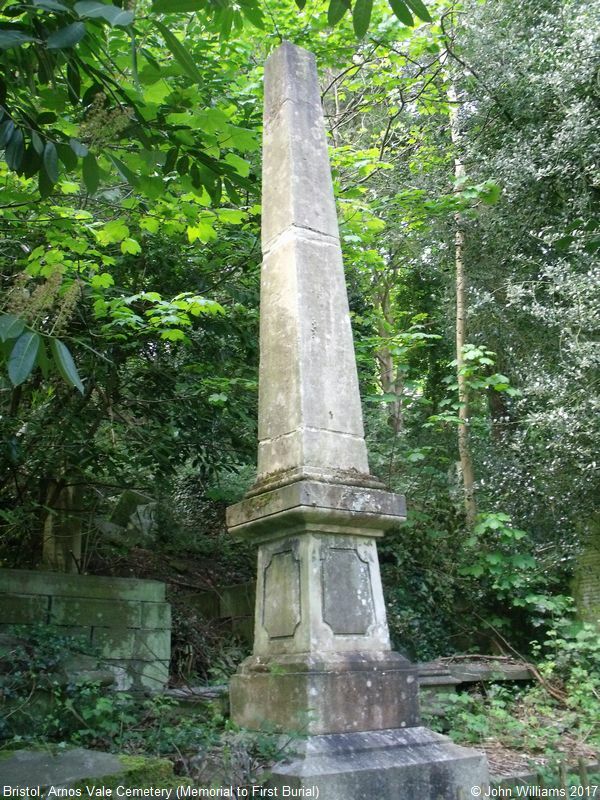 It is the most expensive in the Cemetery, and cost £1,000 when it was erected in 1860. This is roughly equivalent to £61,000 today (2017). The memorial shown on Photograph 4 is unusual, as whilst it looks like stone, is actually made of teak. From the front, obviously, it is cleverly done to look like stone, but the sides show some signs of rotting, indicating it is clearly wood. Photograph 5 is another General View, whilst the simple memorial shown in Photograph 6 indicates the resting place of James Hosken, first Captain of SS Great Britain. Photograph 7 shows the tomb of Raja Rammohun Roy Bahadoor. He is known as the 'father of modern India' and his tomb is a place of pilgrimage. There is also a statue of him on College Green. 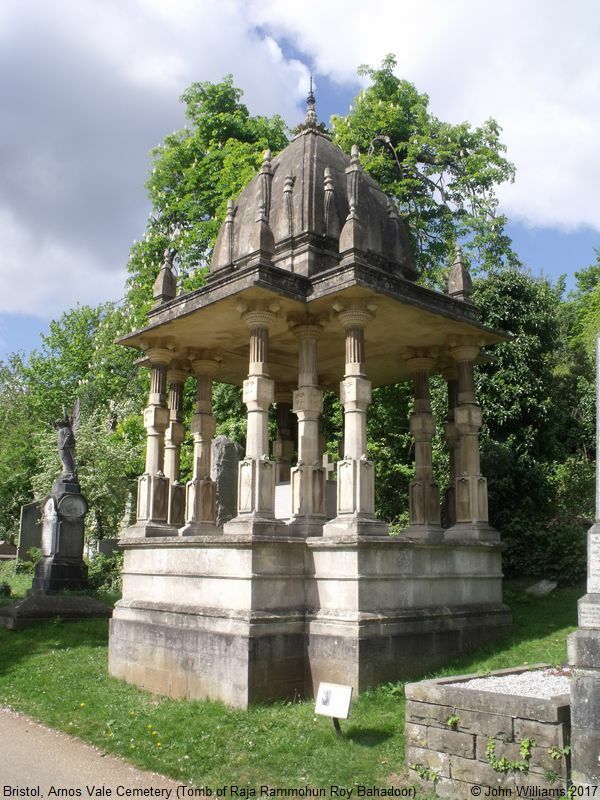 The inscription on the stone indicates he was born at Radhanagare in Bengal in 1774, and died at Bristol September 27th 1833. 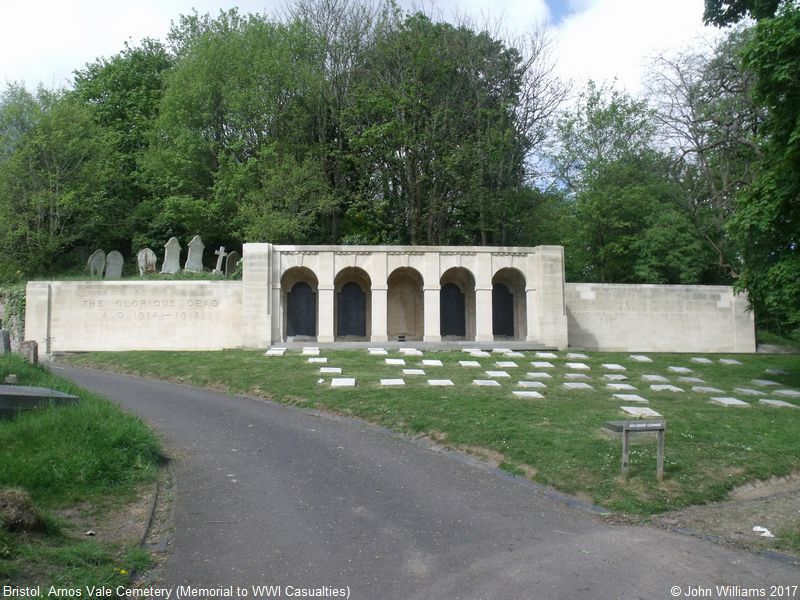 Photograph 8 shows the Memorial to WWI Casualties. Sadly, the ledger stones were removed at some point; and whilst now, some of them have been replaced, this may not be to the same spot they were in originally. There were 239 Casualties in all. 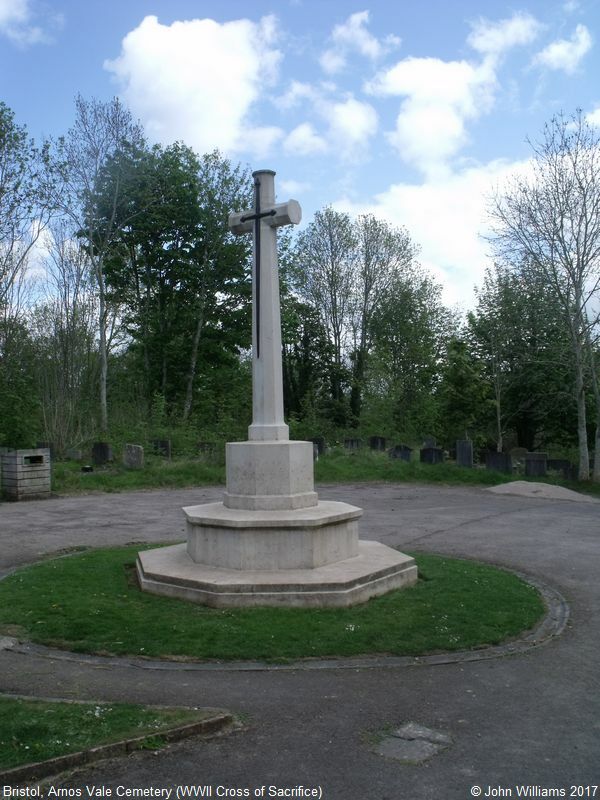 Photographs 9 and 10 show the WWII Cross of Sacrifice, and headstones in the WWII area of the Cemetery. 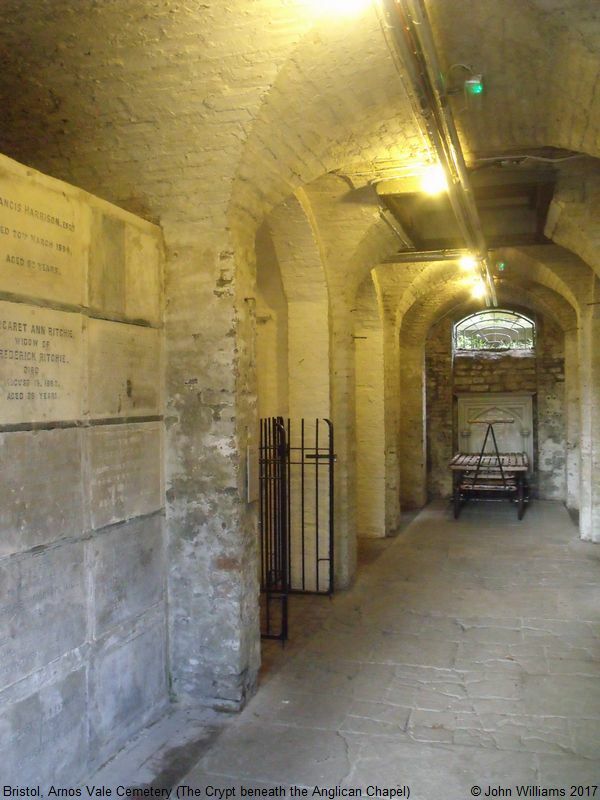 Finally, Photograph 11 shows the Crypt underneath the Anglican Chapel. 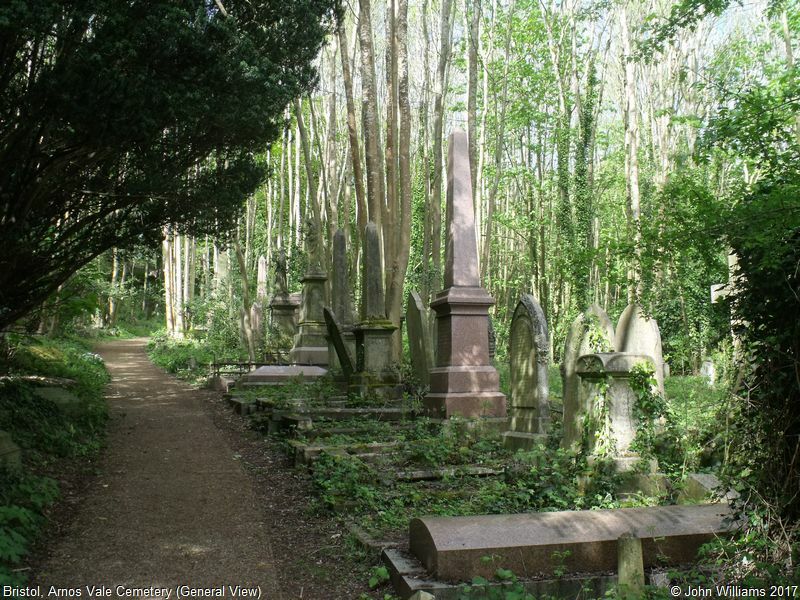 Bristol General Cemetery (Arnos Vale), Arnos Vale, Bristol shown on a Google Map. Information last updated on 12 Jun 2018 at 10:41. 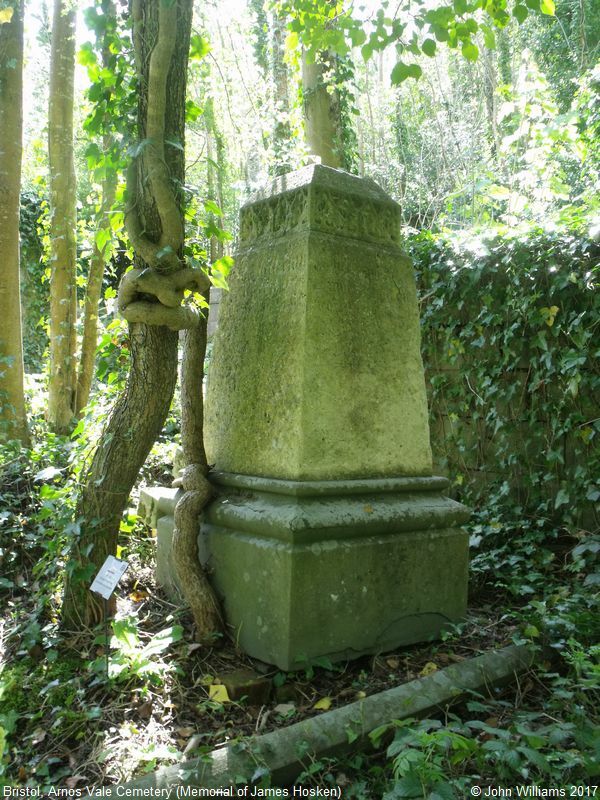 Please also remember that whilst the above account may suggest that Bristol General Cemetery (Arnos Vale) remains open and accessible, this may not remain so. This Report was created 23 Apr 2019 - 00:58:42 BST from information held in the Gloucestershire section of the Places of Worship Database. This was last updated on 7 Feb 2019 at 07:45.